When it comes to sunscreen protection, it pays to be diligent. Take it from me, a skin cancer survivor (and daughter of one, too). When I was pregnant with my older daughter, my OB pointed out a growth on the side of my face that he suggested I get checked. It took me a few years to finally muster up the courage to get this progressive growth examined. I was fortunate that this form of cancer was detected in its early stages. After a rather invasive surgical procedure, I was thankful to put the experience behind me–and vowed to always use sunscreen on both myself and my children. In honor of National Skin Cancer Awareness Month, time-honored favorite Coppertone and another forward-thinking company, MD Moms, are each offering lines of suncreen products for parents and children that deserve mention. One whiff of Coppertone, and I’m immediately transported to the beach and all things summer. It doesn’t take much to convince me to slather on the company’s latest lotions. 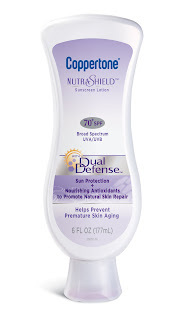 For moms and dads, there’s Coppertone NutraShield in formulas for body and face, and available in SPF 30 or 70. For babies and kids, there’s a new WaterBabies Pure & Simple, made with zinc oxide, and also a SPF 70+ version. The economy-size bottles will get you through an entire summer, and are perfect for stashing in your beach bag. 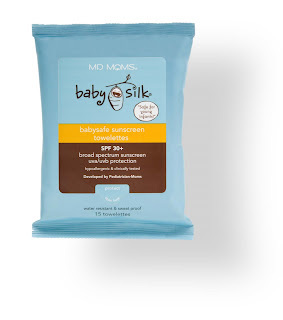 If you’re a mom on the go–and who isn’t it, especially in the summertime?–you’ll really come to appreciate MD Moms baby silk babysafe sunscreen towelettes in their handy dispenser. They work in a flash and are great for kids who can’t seem to keep still long enough for you to apply suntan lotion (you know the ones). I like that the company is as its name proclaims: two moms who are also pediatricians, which gives me more confidence that I’m protecting my kids the right way. What’s more, during the month of May, MD Moms will donate 10 percent of its Web sales to the Skin Cancer Foundation. And all summer long, anyone who orders online will receive a free sunscreen single with the purchase of $25 or more, as well as free shipping and handling. Just use the promo code SUMMER through 9/4/09. If you want to give them a try firsthand, post a comment to me and one lucky recipient will be able to receive some free samples. In a Nutshell: Skin cancer prevention isn’t something to take lightly; it’s vital to long-term healthy living. You take good care of your children all year. Now be sure to take care of yourself, so you can be around to watch them grow.